It's no longer enough just to be constantly connected to the cloud. These days you must also be constantly connected to a slew of different devices. When I'm using my laptop, I'm also monitoring my phone. When I'm on my phone, I still like to view websites on my laptop. Websites are more full-featured on a PC, but many apps are more full-featured on a phone. Samsung thinks it has a solution for my conundrum: Buy a laptop built by a company best known for making phones. Samsung's Ativ Book 9 Lite is essentially a laptop for your phone. Let me explain. The Ativ Book 9 Lite is a thin-and-light laptop with a custom-designed quad-core AMD CPU, a solid-state drive, 4GB of DDR3/1600 memory, and a glossy touchscreen. But its real draw is its ability to connect (somewhat) seamlessly with your Samsung Galaxy device. 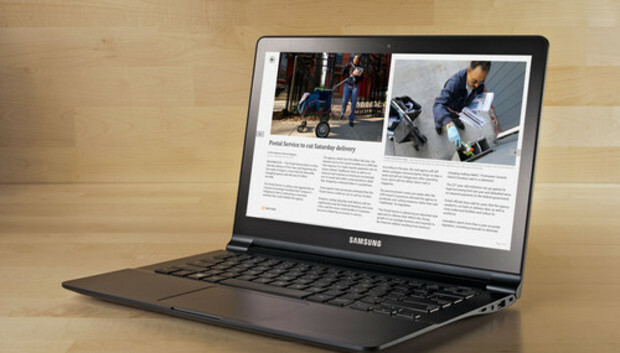 The Ativ Book 9 Lite comes with Samsung's SideSync and HomeSync built in, so you can be constantly connected to both your laptop and your phone. The Ativ Book 9 Lite is far from the shiniest, sexiest, most powerful ultrathin laptop on the market, but if you own a Samsung smartphone or tablet, it does offer one advantage over its competitors: Samsung's SideSync phone-syncing program. SideSync lets you connect your Samsung Galaxybranded phone to your laptop in some pretty impressive ways. With SideSync, you can use your phone as a miniature second screen and control the phone using the laptop's mouse and keyboard. You can compose text messages, open apps, and search Web pages in a mobile browser without ever picking up your phone. SideSync also lets you replicate your phone's screen on your laptop. This feature isn't quite as useful as the mouse- and keyboard-sharing feature, but it's a good way to ensure that you don't miss important phone calls and text messages while you're working on your laptop. In theory, SideSync is a pretty awesome program. After all, who doesn't want an easy, seamless way to connect and combine their laptop and smartphone? But in reality, SideSync isn't quite so seamless. It took me slightly less than 3 hours to set it up with a Verizon Samsung Galaxy Note II. SideSync was already installed on our Ativ Book 9 Lite review unit, but it needed to be updated. Twice. I also had to download the Samsung App Store on my Galaxy Note II, and then download two separate apps (one for SideSync, and one for mouse/keyboard sharing). Next, I had to find a USB cord to plug the phone into the computer, or use a shared Wi-Fi connection (I had been tethering the laptop to my phone's cellular connection via Mobile Hotspot, but apparently that connection just didn't cut it). Then I had to update the software again, since the mouse/keyboard sharing feature wouldn't work without that update. At that point, I was finally able to connect my Note II to the Ativ Book 9 Lite. So setup was a pain in the neck, but once completed, I really appreciated the connection between the two devices. The Ativ Book 9 Lite has a street price of $750 (as of 10/30/13), which puts it just below most Ultrabooks (which range from $800 to $1400), but just above most budget machines (which go for $350 to $600). The third- and fourth-generation Core processors that power Ultrabooks (Intel owns the brand and so controls the specs for it) are much more powerful and power-conservative than the processor that AMD designed to Samsung's specifications. For this laptop's price, we expect to see features such as brushed-aluminum chassis, strong hinges, and high-quality keyboards and trackpads. The Ativ Book 9 Lite is fabricated largely from plastic, it has weaker-than-average hinges, and its keyboard and trackpad are subpar (more on this in a moment). The Ativ Book 9 Lite isn't a bad laptop, but its build is more budget than premium. The keyboard and trackpad are particularly disappointing, since the laptop's winning feature--SideSync--sort of depends on them. The keyboard is just average, with light island-style keys that provide very little tactile feedback. It's simply too light to type on quickly and accurately, and the keys are too slippery to be of any help. If you happen to be sitting still at a desk, this keyboard will be fine. But if you're resting the laptop on your lap or riding on public transportation, your fingers will slip all over the place. The trackpad is worse than the keyboard. It's large, seamless, and erratic. One moment, the mouse cursor is jumping off the screen at the slightest brush of your fingertip, and the next, it's scrolling sluggishly down the page. Rather than having mouse buttons, the entire pad clicks. But this feature is overly sensitive, and it often registered right-clicks as left-clicks, and vice versa. The Ativ Book 9 Lite's glossy touchscreen is a little better than its keyboard, but it's far from exceptional, with a native resolution of 1366 by 768. That's pretty average for a 13.3-inch laptop. It's fairly light with accurate colors and acceptable off-axis viewing angles, although its blacks have a tendency to look gray. It's quite good as a touchscreen: Smooth and very accurate. It works much better for input than the Ativ Book 9 Lite's keyboard or mouse. AMD processors aren't known for their speed. The Ativ Book 9 Lite delivers good performance with productivity applications, such as word processing, Web surfing, and light multimedia usage. It delivered a Notebook WorldBench 8.1 score of 198. That puts it on a par with some of the other Ultrabooks we've tested, such as the Asus B400A Ultrabook (197) and the Lenovo IdeaPad U430 Touch. It's twice as fast as our benchmark testing unit, the Asus VivoBook S550CA. But the Ativ Book 9 Lite isn't a powerhouse, by any means. In our graphics tests, the laptop could barely eke out playable frame rates. In our Bioshock Infinite test (resolution of 1024 by 768 and with visual quality set to low), the Book 9 Lite managed just 15.3 frames per second. It also has a very average startup time of 10.1 seconds, and a below-average battery life of just under 5.5 hours. And that brings us full-circle back to this notebook's Samsung-based advantage. If you own a Samsung Galaxy phone--a Samsung Galaxy S III, Galaxy S4, Galaxy Note II, or Galaxy Note III--the SideSync feature makes the Ativ Book 9 Lite a valuable tool. You can control your phone with your computer (or on your computer), and you can use HomeSync to sync photos and videos between the two devices. If you don't have one of these other Samsung devices, or if you do, but don't intend to use the Ativ Book 9 Lite as an extension of it, look elsewhere. You'll get a higher-quality laptop for a lower price.